Form CALHR878 or the "Department Certification Of Funding And Participation" is a form issued by the California Department of Human Resources. The form was last revised in March 1, 2018 and is available for digital filing. Download an up-to-date Form CALHR878 in PDF-format down below or look it up on the California Department of Human Resources Forms website. Annual Leave Cash Out Program for fiscal year 2017-18. 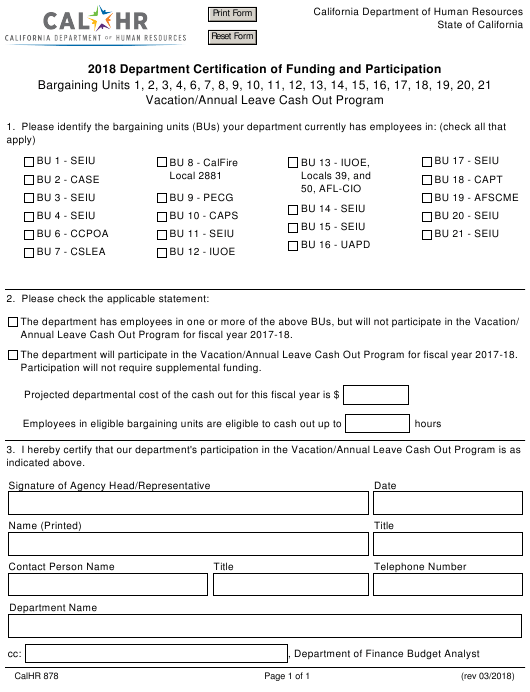 The department will participate in the Vacation/Annual Leave Cash Out Program for fiscal year 2017-18. Participation will not require supplemental funding.